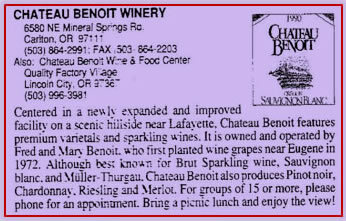 Dr. Fred and Mary Benoit founded “Chateau Benoit” in 1979 when they bought 60 acres near McMinnville. A home, winery, and medical offices were built. Vineyards were planted. Their Muller Thurgau and sparkling wines were popular. Chateau Benoit also bottled wine under the Nisqually Ridge label. In 1999 the winery was sold to Robert Pamplin Jr. In 2004 the name was changed to Anne Amie Winery. The winery was located at 6580 Mineral Springs Road, Carlton, Oregon. Fred soon gave up his medical practice. More winemaking, less golf!